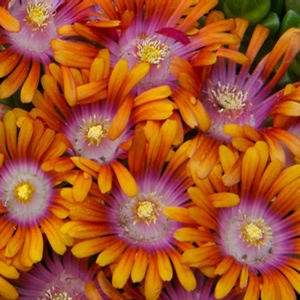 Delosperma Fire Spinner is a registered trademark, brought to us by Plant Select. 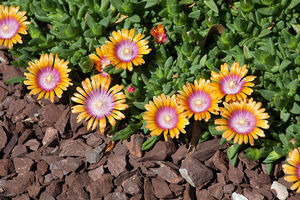 Bring vibrant color to the walkway or rock garden with this fast spreading succulent ground cover. Head spinning multi-colored flowers have bright orange petals that are purplish-pink toward the center and surround a white eye. The 2" tall light green succulent foliage is covered with blooms in late spring to early summer. Plant in full sun to part shade in moderate to dry soil. 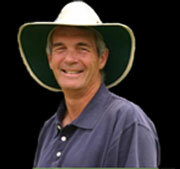 Plant in full sun to part shade in moderate to dry soil.